Well, let me tell you how sad I am. In case you have been living under a rock so busy enjoying your summer off, you know that Google Reader is no more as of July 1. Well, I'm not sad that it is going away because I don't have another way to read it. I'm really sad that my 800 followers (who I feel I have worked so hard to get you here) are now down to 240 according to bloglovin. Bloglovin is now the easy way to read your blogs. I would LOVE for you to follow me there. Please click on the button above or the button on the top right to follow me now and I hope I will soon be back to 800. If you want to follow all of your favorites that you currently follow in Google Reader, you can click here to find out how to use bloglovin. Also, my giveway ends TONIGHT! Hurry! I will be back tomorrow with 2 winners!!!! 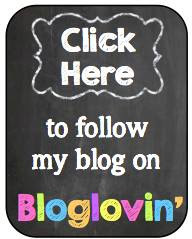 Where did you get the cute bloglovin pin? Love it!